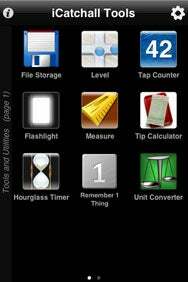 The App Store offers countless utilities—many priced in the $1 range—that perform single tasks like calculating tips, converting measurements, or beaming a flashlight. Headlight Software decided to make a single app that encompassed those types of mini-applications and many more—iCatchall Tools. The Apps Within: Whether you’re using iCatchall Tools or the larger iCatchall, the first thing you’ll see is a screen of mini-apps that’s quite similar to the iPhone’s home screen. Actually, the developer made two such apps; in addition to iCatchall Tools, which offers a collection of 15 apps, there’s iCatchall, which adds nine more mini-apps to the mix for a total of two dozen. Both apps sport a $1 price tag. Not every mini-app within the two flavors of iCatchall is awesome, but there are enough powerful tools within both apps to recommend them, particularly given their affordability. Whichever version you use, iCatchall opens with a screen intentionally reminiscent of the iPhone’s own home page. You swipe between the multiple screens of mini-apps, and tap the one you want. My favorite iCatchall mini-app is File Storage, which appears in both versions. Like several other iPhone apps (some of which cost quite a bit more than iCatchall), File Storage allows you to copy files to and from your iPhone. The mini-app starts a Web server, which you can then access from any Mac or PC on the same local network. The Web interface feels clunky (I prefer the iPhone-optimized Web layout, even from my desktop), but it’s functional. You can upload any file type, and you can view those that the iPhone understands—Word/Pages documents, spreadsheets, images, PDFs, and text files. You’re even able to edit plain text files and save your changes. The whole system works well. And that’s just one of the dozen-plus apps within iCatchall Tools (or 24 in iCatchall). 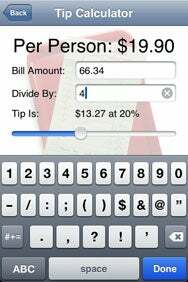 Tip Calculator works great; it remembers your preferred tipping percentage, and lets you split the bill easily, too. If you hate doing math and love whipping out your iPhone, it will certainly satisfy. Flashlight makes the screen super bright, and as father to two young daughters, I go the iPhone-as-flashlight route frequently when fetching more diapers from their rooms after bedtime. The Unit Converter mini-app sports a great interface. Using scroll wheels, you can quickly see how to convert X of just about anything into Y of just about anything else. Kitchen, length, weight, speed, and temperature measurements are all included. Tip of the Iceberg: Tip Calculator, featured in both iCatchall and iCatchall Tools, lets you figure out how much to leave for a tip as well as split the bill among multiple diners. The Level and Ruler work about as well as you’d expect. The ruler’s a little small to be genuinely useful, and the level performs ably in a picture-hanging pinch. Tap Counter—you guessed it—counts taps. The cool feature here is that tapping with two or three fingers at once ups the number by the right number of digits. This has limited use in my daily life, but one day I’ll need to count something by taps, and iCatchall will be ready. Remember 1 Thing stores the one text note you enter—useful if you frequently forget where you parked, or what page you’re on in a book. Hourglass Timer works adequately. The hourglass theme seems a bit unnecessary, since the “sand” falling isn’t smooth, and flipping the hourglass just resets things, instead of sending that sand back the other way. But if you lose your Taboo timer, this makes a fine substitute. iCatchall also offers Flip a Coin, Today’s Moon, and Rock, Paper, Scissors. None of those are particularly useful to me, and I’d love to be able to delete or hide them, and to rearrange the icons I do use to suit my liking. But as much as the app tries to emulate the iPhone’s springboard, those important elements of functionality aren’t there yet. A recent update to both apps added a digital alarm clock, dice roller, card dealer, personal massager (using the iPhone’s built-in vibrating mechanism), and—the most useful newcomer—a contact cloner that lets you copy address book entries from other iPhones and iPod touches on the same wireless network. The larger iCatchall app differentiates itself from iCatchall Tools by adding more goofy mini-apps, ranging from games like Kitchen Sink to high-five animations and sound-effects for flatulence, audience cheering, or a rim-shot. The appeal of iCatchall Tools to me is the quick access to a few utilities I need frequently—often daily. The extra goofy apps in the bigger version don’t add value for me, so I’ve only left Tools installed. Sometimes, after quitting a mini-app, iCatchall’s springboard won’t reload properly for me. I see just a black screen, and must scroll horizontally to bring the app icons back into view, but they’re no longer clickable. When that happens, I must restart iCatchall to get things working again. Even if you only end up using a couple of the dozen to two dozen apps available in either iCatchall Tools or iCatchall, Headlight Software’s apps are likely a good deal. Most mini-apps perform capably, and look pretty good. I like saving real estate on my main iPhone apps home page, so iCatchall is an economic choice in more than one way. iCatchall Tools and iCatchall are compatible with any iPhone or iPod touch running the iPhone 2.x software update.